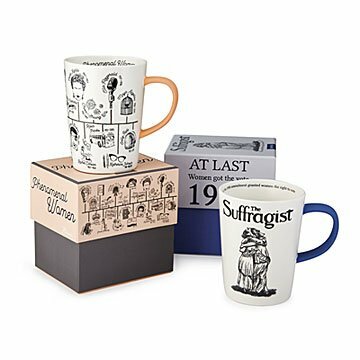 Add a dose of empowerment to your coffee with these mugs featuring important dates in women’s history. How do you add an extra dose of get-up-n-go to your coffee? Serve it in a mug that's pumped up with empowerment. Whether you're marching through the morning with suffragists or sipping inspiration from phenomenal women, these illustrated mugs are a reminder that women can accomplish amazing things. Created by Rosanna Bowles, who credits Maya Angelou's poem "Phenomenal Woman" as the inspiration for her women's rights collection, each stoneware mug displays important dates and figures in women's history. Suffragists depicts a suffragette and Lady Liberty celebrating victory with a hug, and includes important dates in the women's suffrage movement, while Phenomenal Women features a timeline honoring strong women throughout history. (Oh hey, Frida Kahlo and Katherine Johnson.) Made in China. The mug is easy to travel with, holds a lot of liquid, and it is interesting to learn about the women that have made history.